What is the connection between these two monuments? When studying ancient India students need to understand the importance of the ruler Asoka and the time of the Mauryan Empire. One way to introduce this lesson is to ask students, “What is the connection between these two monuments?” The connection, of course, is that they are both national symbols. 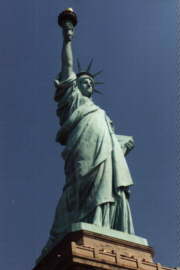 The Statue of Liberty, one of America’s national symbols and the lion capital of Asoka, adopted as modern India’s state symbol. This introduction leads naturally on to the next questions. 1. Who was this ruler Asoka, whose lion capital was chosen to be modern India’s emblem. 2. Where did he live and what was the Mauryan Empire? 3. What kind of ruler was he? 4. Why do modern day Indians value a symbol from his time? Module 2 introduces students to this unusual king of the ancient world. He was an emperor who, instead of basking in the glory of a victorious battle, was shamed and distressed by the bloodshed, slaughter, and misery of the defeated people. Rubrics are supplied with the assignments for teacher assessment or student self-assessment. Buddhism and Hinduism – In Module 2 of the WER Unit on India, Buddhism is introduced before the lesson on Asoka so that students are able to understand the ruler’s conversion to Buddhism. Hinduism is also covered in detail; both Buddhism and Hinduism being taught through activities, stories and drama. Students, armed with an understanding of both beliefs, are able to make an informed comparison between the two. A Venn diagram is an ideal format within which to organize a compare and contrastassignment of Buddhism and Hinduism. A large, poster size Venn diagram could accommodate contributions from many students and would look attractive with illustrations added. Through the creation of a class poster entitled A Moment in Time the Indus Valley civilization is compared with civilizations prospering in other parts of the world at that time. Students create seals in clay similar to those found in the Indus Valley and compare them with the seals of Mesopotamia. Mapping Skills: Students work with outline maps, developing geographic skills and learning geographic terms. Creative Skills: Creative Skills are developed in the hands-on activity of making personal seals. Critical Thinking Skills: Students compare and contrast societies. They examine these societies to see if each one meets the criteria to be called a civilization. Presentation Skills: Students present their civilization orally, with illustrations, to the rest of the class. India (2 Modules) includes 3 stories with readability levels, 4 guided reading assignments, 1 drama with readability level, 1 readers theatre, 16 activity sheets, 2 assignments targeted for monitoring and assessment, 3 map activities, 21 illustrated information sheets, 9 blackline masters, 3 review exercises, 2 colored reproductions, 8 teacher lesson guideline sheets, 2 monitoring and assessment guideline sheets.